With some 4,000 parcels of land laying idle or abandoned across Iowa because of potential contamination, local governments are failing to apply for government cleanup money that could flip them into productive, job creating businesses. Iowa cities and counties are not tapping into programs that would pay the costs of cleaning up these blighted, brownfield areas. Some city council members and others in local government leadership do not even know the programs exist, an IowaWatch investigation revealed. 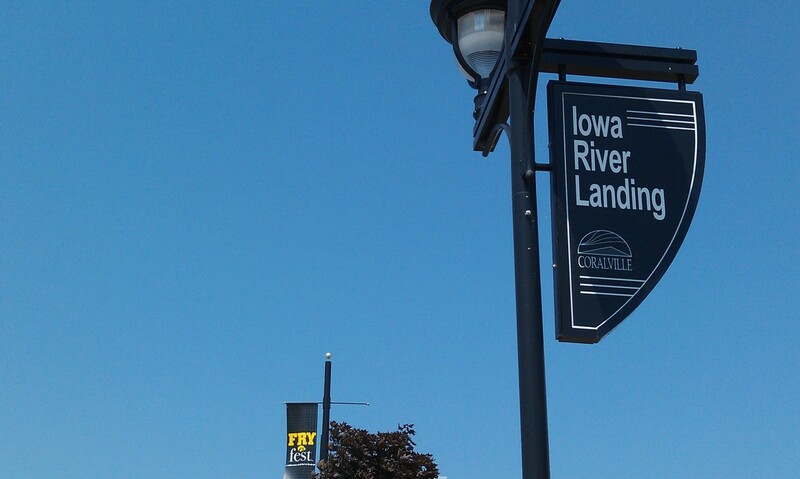 Coralville has spent $1.9 million in federal brownfield cleanup money to develop the Iowa River Landing District, envisioned as an urban retail, commercial, entertainment hub along Interstate 80. It used a consultant to help weave through the grant-writing process. Other Iowa cities and towns have not tapped into brownfield funding programs available to them. This view is from the main turnaround and fountain. When they do, many avoid the federal government’s brownfield cleanup program because applying for a grant has proved to be a daunting, unwanted task. A paid consultant usually is needed to wade through the dense, time-consuming – but also required – paperwork. Cities and towns do not have the money needed to apply. Moreover, the U.S. Environmental Protection Agency (EPA), which funds state programs like Iowa’s, does not measure the extent to which its program reduces environmental risk, the IowaWatch investigation showed. The agency relies on trusting local recipients for its oversight. A federal, competitive grant program run by the EPA, in which allocations are made up for up to $200,000 to assess a site for hazardous substances, pollutants or contaminants and up to $200,000 to deal with a site contaminated by petroleum. A state Department of Natural Resources program, with $600,000 annually, that redistributes a smaller portion of EPA funding in the public sector. A brownfield is a site that is or potentially could be contaminated. 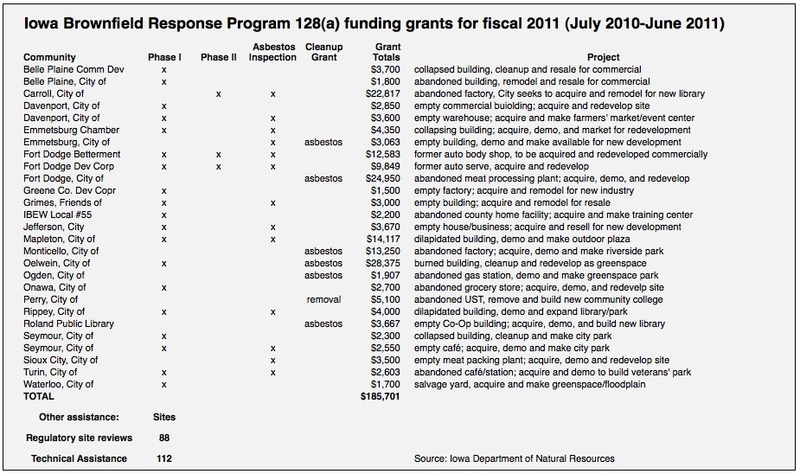 In Iowa, asbestos is the most common type of contamination in brownfield projects. Lead-based paint is a major concern, too, because of its connection to elevated blood levels and accompanying illnesses in people. Steve Prideaux of HR Green, an environmental consulting company widely used in Iowa, said the firm typically charges a flat fee of $7,000 to write a grant. 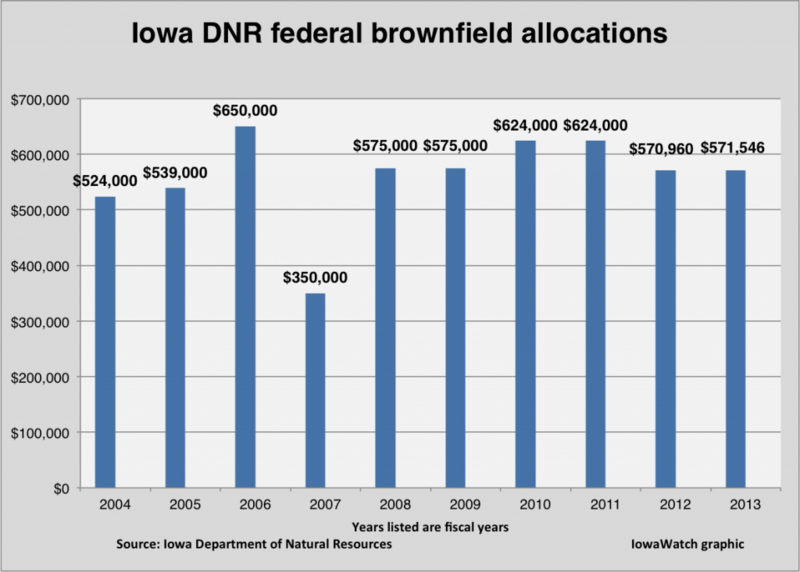 The Southeast Iowa Regional Planning Commission, which covers Des Moines, Louisa, Henry and Lee counties, applies yearly on its own for EPA brownfield funding but has received only two communitywide assessment grants, in 2004 and 2008. Nevertheless, the two grants that were awarded touched eight sites in southeast Iowa: in Keokuk, Fort Madison and Burlington. “These grants have really tangible benefits. Having them gives underutilized sites potential,” Norris said. Eric List, the economic development contact for the northwest Iowa town of Pocahontas is like others in Iowa who have said they were not aware of the state brownfields program, or that applying for federal grants was a daunting task. List said the only development interest in town is in greenfield areas, and that he has not detected or designated any brownfields. Klein said some cities and towns would rather work with their state program, and a handful do. (see lists below) “Most cities don’t want the federal government to walk into their neighborhood,” she said. She said the EPA only approves approximately a quarter of the all applications and an application pulls more weight if the proposal has a community drive master plan. “A proposal that is based on community goals that have been derived through public meetings should score higher than one that doesn’t. We don’t make value judgments,” she said. The exact number of brownfield sites in Iowa, or even nationally, is not counted. The 4,000 for Iowa is an estimate. A 2004 report by U.S. Government Accountability Office estimated 450,000 to 1 million nationally. Mel Pins, the brownfield director at the Iowa Department of Natural Resources, said getting an accurate count is like asking the state health department, “how many alcoholics are there in Iowa?” If you could count how many people attend Alcoholics Anonymous meetings you would be counting only one small portion of all alcoholics. The best way to find brownfields, he said, is to perform what he calls a windshield survey, or essentially driving down Main Street with a city economic development person and looking at what land isn’t selling. Pins tries to get word to cities about the available funding but often to an indifferent audience. In July, a small collection of city council and economic development officials from Iowa gathered for a brownfield grant-writing workshop hosted by the EPA at the Coralville Marriott & Conference Center, which is situated in a former brownfield. Pins said he sent almost 3,000 emailed invitations. Only 13 people showed. Pins said municipal leaders are missing out on a program he tailored specifically to help the public sector and nonprofits. DNR and EPA officials urged city representatives at the Coralville meeting to sell their story by bulking up applications with the best demographic data that supports fund requests. Show high poverty in the area if it exists, participants were told. Contact the Iowa Hospital Association for health data for your region. “All they want to see is if your site has brownfield stigma. The EPA wants to see a case for environmental impact,” Pins said. 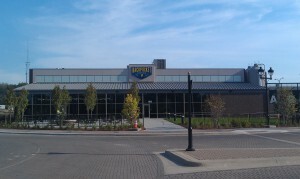 Fort Dodge, in northwest Iowa, used Iowa DNR brownfield funds to help keep a local Fareway grocery store downtown. “Whenever we have a developer come and say they want to construct a new building, rather than sending them to greenfields, we look for infill development like a brownfield site to clean up,” Vickie Reeck, community development manager in Fort Dodge, said. The funds supported soil and groundwater tests in a dilapidated two-block area in downtown, Reeck said. The city used $5,346 in DNR brownfield grants to assess the site and inspect for asbestos in nearby buildings and the DNR spent $21,000 for its own site assessment. A 33,000-square-foot new Fareway store opened in 2011. The EPA swears by a level playing field when it comes to its selection process. Cities as big as Detroit, with an estimated 706,600 people, and as small as Fort Dodge, with 25,000 residents, are to be able to reap benefits. But the poverty rate is not the only factor for obtaining brownfield funding. In Coralville, which has used brownfield money to clean up the site of a major development, 10.1 percent of the people lived below the poverty level during the 2000 census. In the 2010 census, 14 percent lived below the poverty level. Coralville, in east-central Iowa, has conducted 109 site assessments and seven cleanups, spending $1.9 million that the EPA has supplied with 10 grants since 1999. Coralville’s brownfield area, the Iowa River Landing District that is being developed along Interstate 80 between the Iowa River and the city’s First Avenue, is the most successful brownfield site in the state — some say even in the region — in terms of obtaining and using funds to revitalize a run-down area. 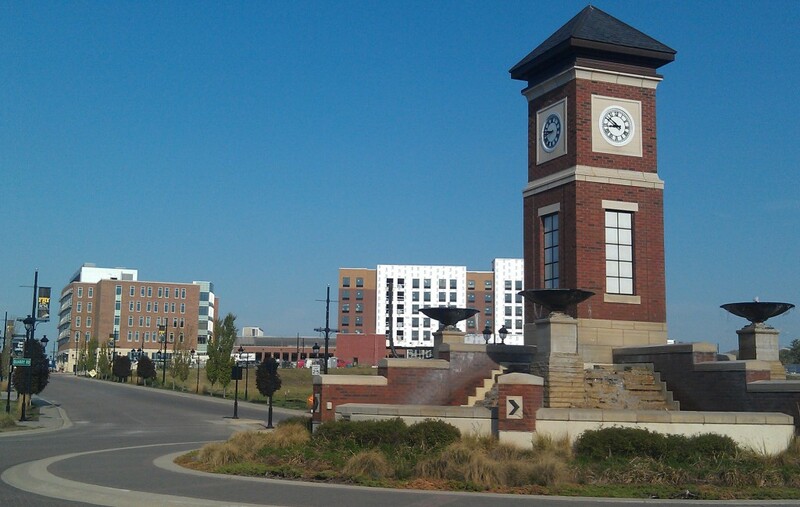 Development professionals IowaWatch interviewed pin Coralville’s success to the city having a brownfield coordinator who serves as a go-between with an environmental company and city engineers. “I always joke when we’re hiring a new coordinator around grant writing time, that there’s no pressure on you, but everyone before you has gotten the grant,” City Engineer Dan Holderness said. Cities with large grants got a head start when large environmental consulting firms like Terracon and HR Green approached their city councils about brownfield grants, and then offered their services. Working with HR Green, Waterloo is close to Coralville in terms of impact, collecting $1.85 million in EPA money since 2000 to redevelop its downtown business district. The city has used that money for ground assessment and cleanup and to leverage grants from other funding agencies. HR Green first suggested to Coralville that it pursue federal brownfield dollars in 1999. The 120-acre area designated as a brownfield had been home to a large truck stop, several warehouses, a scrap yard, repair shops and a strip bar. At one time Coralville worked with Des Moines philanthropist Ted Townsend on locating Townsend’s dream project, an indoor artificial rain forest, at the site. But that broke down after the nonprofit organization heading the rain forest effort, first called Iowa Child and eventually Earthpark, failed to deliver. 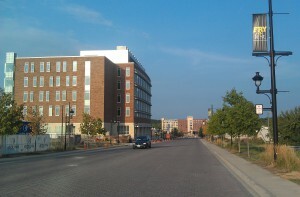 Coralville moved to Plan B: an urban mix of commercial and retail buildings, hotels, a medical clinic operated by the University of Iowa, townhouses, a theater, an arena and a transportation facility, costing an estimated $30 million to $40 million over several years. Even with only a handful of Iowa cities showing interest in seeking funds, Mel Pins said the nearly $600,000 the EPA gives Iowa’s DNR annually hardly scratches the surface of the need he sees in the state. That leaves federal EPA grants as the state’s main source of funding for brownfield cleanup. The national allotment this federal fiscal year was cut by $6.7 million, to $68 million. “This particular grant just so happens to be incredibly competitive because there are so many brownfields and only $68 million for the whole country. That’s not enough money,” said Jennifer Fencl, environmental services director for the East Central Iowa Council of Governments. The EPA headquarters said in a prepared statement to the Investigative News Network, which found issues in other states similar to those in Iowa, that applicants with interested developers or other partners are likely to score higher in the competitive grant process. “We often see our involvement as the first step in attracting developers and other partners to the project,” the EPA said. MacKenzie Elmer reported and wrote this story during spring and summer 2012 while with IowaWatch. She is a reporter for the Burlington Hawk Eye. This story is part of a national report called Wasted Places: America’s Brownfields. It is a collaborative investigation by six nonprofit newsrooms into federal and state programs designed to clean up and redevelop polluted tracts known as “brownfields.” The project was coordinated by the Investigative News Network, and reported and written by the Connecticut Health Investigative Team, City Limits, the Iowa Center for Public Affairs Journalism, the New England Center for Investigative Reporting, the Wisconsin Center for Investigative Journalism and INN. Despite about $1.5 billion in federal grants and loans doled out by the Environmental Protection Agency over 19 years, hundreds of thousands of abandoned and polluted properties known as “brownfields” continue to mar communities across the country, the Investigative News Network and five nonprofit newsrooms report in this story. The shortcomings are due to limited funds, a lack of federal oversight, endless waits for approvals and dense bureaucratic processes that make it difficult for poor and sparsely populated neighborhoods to compete against larger and middle-class communities that have the means to figure them out. Workloads for eight state investigators who determine whether herbicides are applied properly in Iowa have more than doubled the past two years, with no plans in sight for adding staffers. The workload increase — from 110 misuse reports in the 2016 crop year to 249 in the 2018 crop year — coincides with the introduction by agrochemical companies of dicamba-based herbicides to kill weeds in farm fields.